I ordered both this title and Altered Carbon based on the reviews. The first one was okay, but it seemed rather long and it never really developed for me. The narration was top-notch, but I just never got engrossed in the storyline. If I had not already gotten Broken Angels, I might have given it a pass. However, since I had it already, I decided to give it a chance. I'm so glad I did. This story was much more engaging. Altered Carbon was more of a detective story, albeit in a Science Fiction setting. This time around, it's more of a SciFi/action story. It seemed to help that Takashi had a large supporting cast to interact with this time out as well. Unlike what others have said, I don't feel it is necessary to listen to Altered Carbon first. This book stands on it's own and other than a couple of references to the previous book, there are no ties storywise. There are more references in both books to other events in the character's past that are not (yet) contained in another book, that you'll be hard-pressed to identify the Altered Carbon references if you aren't already familiar with it. 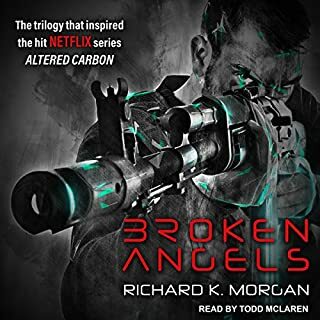 In short, you won't be at a disadvantage nor less likely to enjoy this book if you haven't read/listened to Altered Carbon. Did I read the same book as some of you? Books normally get reviewed on the story and the author's ability to grab the reader. Interesting plot, engaging characters, theme, mood, and style all affect the reader's enjoyment. This is all subjective and what one reader can't put down, another might find boring. With audio books there is the additional element of the narrator/reader that impact's the listener's enjoyment and also impacts the rating it might get. This is the first impulse purchase I've made. I used to spend a fair amount of time selecting the books I choose to spend my Audible credits on, but after 4+ months of listening to Stephen King's Dark Tower series, I was not only ready for something different, I had gotten out of the habit. 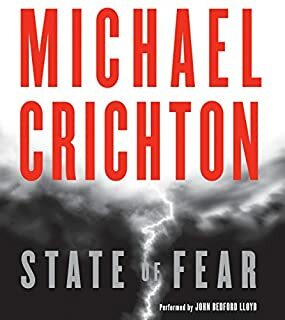 When the "Audible recommends" email showed up and I noted that State of Fear was a hot download, I impulsively selected it. In hindsight, I wish I hadn't been so impulsive. I'm only a little over 2 hours into it, but I am strongly leaning towards not wasting any more of my time on it. As noted by others, the narrator is not pleasant to listen to and his bodily noises make it even less so. I've tried to put up with it hoping that the story would be worth it, but it is developing so slowly, I'm tired of waiting/hoping for it to get interesting. I haven't read or listened to a Michael Crighton novel before so I am unfamiliar with his style and don't know if this is typical of his books, but after this, I would be leary of taking a chance on another one of his. I also haven't paid much attention to who the narrator is in the past since I hadn't previously encountered any that made a book difficult for me to listen to, but I will be checking from now on and avoid any read by this narrator.